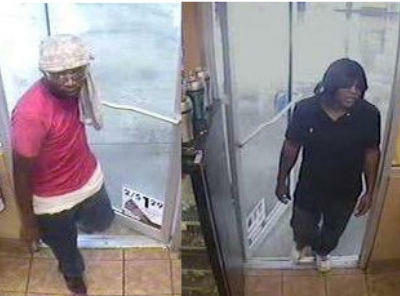 Two wanted for armed robbery at Mt. Pleasant gas station | Crime Stoppers of the Lowcountry: 554-1111 | 1-888-CRIME-SC | Anonymous tips earn cash rewards with Crime Stoppers of the Lowcountry. MT PLEASANT, SC - Police have released footage of two men who allegedly held up a Circle K gas station and convenience store on Johnnie Dodds Boulevard Tuesday morning. Mt. Pleasant Police Captain Stan Gragg said the store at 685 Johnnie Dodds Bouelvard was held up at knifepoint at 11:42 a.m.
Police say the suspects are black males estimated to be in their twenties. The first suspect was described as being slim and about 6' tall, wearing a magenta-colored shirt and blue jeans, along with a gray t-shirt wrapped around his head. The other suspect is described as a stocky man standing about 5'8". He was wearing a black wig, a black shirt, and blue jeans. That suspect was also wearing sunglasses. If you have any information regarding these suspect, call Crime Stoppers at 554-1111.